Prior to my year of service, I was aware that education inequities existed across the United States, mainly affecting low income communities of color. When I moved to inner city St. Louis, I quickly learned that this city has a polarized education system. Either you invest thousands of dollars into private, Catholic school, or your child can attend the free, yet low performing public schools. Public school is the reality that many low income families in St. Louis face because they cannot afford to send their children to private school. Fortunately, Marian Middle School is dedicated to ending the cycle of poverty by providing adolescent girls with holistic, faith based education. One of the traditions at Marian is to share Wisdom Words each day during morning assembly. Wisdom Words are daily passages that are intended to motivate the students. With a background in Women’s & Gender Studies and a hidden feminist agenda, I volunteered to write the Wisdom Words for the month of March in honor of Women’s History Month. Often when learning about history in America, it is very male dominated. This is present throughout textbooks, media, and national holidays. I saw writing the Wisdom Words during March as an opportunity to educate the students about women in history. One day, I wrote Wisdom Words about the importance of attending college. The historical figure I focused on was Dr. Susan La Flesche Picotte, the first Native American woman to earn a medical degree and become a doctor. One of the sweetest and most adorable 5th graders asked if she could read the Wisdom Words during morning assembly. I graciously said yes. This 5th grader has a tendency to be shy when talking to people. I knew reading the Wisdom Words would be a great opportunity for her to practice her public speaking skills and a great confidence booster. The 5th grade student did not have much time to practice. However, you could not tell! In front of an audience of 80 people, this 5th grade student read the Wisdom Words clearly and with confidence. Afterwards, everyone clapped and cheered for her. I was extremely proud, for many reasons. One, public speaking is a very common phobia and like any skill, requires practice. (I still get nervous and I have been public speaking for 8 years.) Two, she correctly pronounced, “La Flesche Picotte”. Three, having a reading level below her grade, I was amazed by how this 5th grade student did not display an ounce of nervousness or stumble over her words. Later that day, the president of the school stopped me in the faculty work center to thank me. I was unaware of it at the time, but one of the many professional women who voluntarily mentors for the 8th grade students was present during morning assembly. According to the president, her grandfather was Native American. She was so touched by the Wisdom Words that she offered to donate $3,000 to sponsor a student for an entire year. The theme of this story is to live out your passions because they can inspire others. When we live out our passions, not only do we nourish our souls, but we can transform the lives of others. My passions are feminism and public speaking. When writing the Wisdom Words, my only intentions were to educate the girls about women in history and to provide a student with a chance to practice her public speaking skills. I had no idea my writing would create an opportunity for another girl to attend Marian. 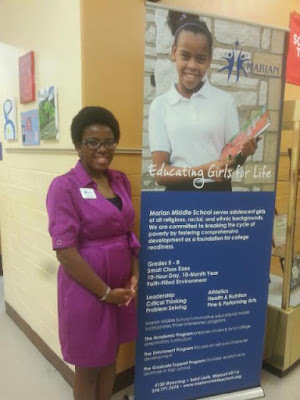 My Wisdom Words empowered the Marian community beyond what I could imagine. I am extremely thankful for the opportunity to write the Wisdom Words. Similar to the students, Marian has fostered a place for me to discover and practice my talents. After writing the Wisdom Words, I learned that I am talented when it comes to writing and that youth enjoy learning about history if you present it in an interesting way. It is not by coincidence that groups of historically oppressed people are rarely included in our history books. Our history lessons, whether in school or mainstream society, reflect who is deemed worthy in America’s eyes. In this case, it is white, heterosexual, able bodied, cisgender, men. In the future, I want to continue to educate youth about untold histories, specifically the histories of African Americans and women. This will give opportunities for underrepresented groups to have their stories heard and youth will be aware that history has multiple facets. When we unveil new knowledge to our youth, we unveil a new world. To learn more about the Vincentian Mission Corps, click here! CVN AmeriCorps Photo Contest Winners!